The Steichen Collections Luxembourg assemble works that are connected to the heritage of Edward J. Steichen (1879 – 1973) and his long, fruitful career related to photography. The Steichen Collections Luxembourg assemble works that are connected to the heritage of Edward J. Steichen (1879 – 1973) and his long, fruitful career related to photography. Several public collections testify his prolific creation as a photographer and curator at the New York Museum of Modern Art (MoMA): those of the National Museum of History and Art (MNHA), the City of Luxembourg and the National Centre for Audiovisual Arts (CNA). The Family of Man is a legendary photographic exhibition, created by Edward Steichen for the New York Museum of Modern Art (MoMA) in 1955. The exhibition reflects the humanist photography of the post-war years, declaring itself a manifesto for peace. Images by artists such as Robert Capa, Henri Cartier-Bresson, Wayne Miller, … were staged in a modernist and spectacular manner. After an international tour, the exhibition is now shown permanently at Clervaux castle and is part of the UNESCO’s Memory of the world list. The Bitter Years is a tribute to documentary photography, featuring more than 200 images from one of the greatest collective projects in the history of photography: the documentation of rural America during the Great Depression by the Farm Security Administration. Created in 1962 by Edward Steichen for the Museum of Modern Art (MoMA) in New York, the exhibition is today housed permanently in the Waassertuerm+Pomhouse in Dudelange, bringing together the iconic works of photographers, such as Walker Evans, Dorothea Lange, Arthur Rothstein and Russell Lee. A gallery dedicated solely to Edward Steichen, is the MNHA’s homage to his career as a photographer. The collection consists of 178 photos bequeathed to the State of Luxembourg by Steichen himself. The MNHA also conserves and exhibits the 44 photographs from the Steichen Collection belonging to the City of Luxembourg. For conservation reasons, both collections are displayed in cycles, presenting around 20 photos at a time. 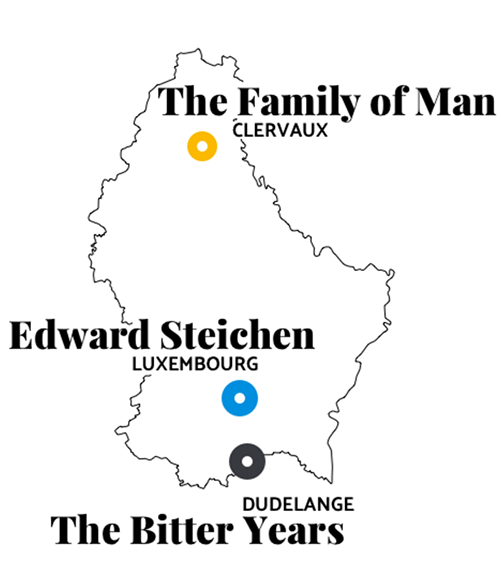 The Steichen Collections of the Grand-Duchy of Luxembourg assemble works that are connected to the heritage of Edward J. Steichen (1879 – 1973). The American artist of Luxembourgish descent is world famous for his remarkably long and fruitful career related to photography. Not only was Edward Steichen a very prolific photographer, he was also director of the photography department at the Museum of Modern Art (MoMA) in New York, where his work as curator of photographicexhibitions was acclaimed worldwide. The collections on display in Luxembourg reflect his two-fold activity: while the MNHA and the Villa Vauban honour the photographer with a selection of his private and commissioned works, the Centre national de l’audiovisuel (CNA) with its two collections The Family of Man and The Bitter Years, highlights his achievements as curator, assembling the works by famous photographers. The life of Edward Steichen (1879-1973) spanned a rich and varied artistic career: known above all for his photography work, he was also a painter, director, MoMA curator, gardener and passionate experimenter. Born Bivange (Luxembourg), March 27. Fils de Jean-Pierre Steichen et de Marie Steichen Kemp. First solo exhibition at private home, Milwaukee, WI; studies at Academie Julian, Paris. Paintings and photographs exhibited in Paris; elected member of Linked Ring: London photographic society; meets Rodin.